British Prime Minister Theresa May has dismissed an account of a difficult meeting between her and the head of the European Commission as "Brussels gossip", insisting that the meeting had gone well. However, a number of sources have told RTÉ News that while the dinner hosted by the prime minister in Downing Street last Wednesday was civil, there was a wide gap in perceptions between both sides about what was realistic during the negotiations. The dinner took place in Downing Street between European Commission President Jean Claude Juncker, the EU's chief negotiator Michel Barnier and Mrs May. It is understood the purpose of the meeting was for Mr Barnier to have an informal encounter with the prime minister in order for him to become more familiar with the British system. However, reports filtered out during Saturday's summit of the EU27 in Brussels that there was disbelief on the EU side at the expectations the British government were entertaining ahead of the talks beginning. Today a German newspaper published an account of the dinner, quoting Mr Juncker, via one source who was present, as suggesting he was ten times more sceptical that there could be a deal between both sides. It was reported that Mrs May had denied there was any legal obligation on Britain to pay potentially billions of euro in liabilities on leaving the EU, and that she expected a free trade deal to be completed within the two-year process. Sources have suggested that the general election may influence events. Mrs May dismissed the report as nothing more than "Brussels gossip". But a number of well-placed sources have said that there is a dramatic gap between what Britain thinks it can win in these negotiations, and what the EU is prepared to concede. A spokesman said the British government did not recognise the reported account of events, and Mrs May addressed the issue directly in comments to supporters during an election campaign stop in northwest England. "I have to say, that from what I've seen of this account, I think it's Brussels gossip," Mrs May said, adding again that the meeting had been constructive. Mrs May said that the account in German media showed once more how difficult talks would be. "It ... shows that these negotiations at times are going to be tough," Mrs May said during her campaign stop. However, the reported disclosures, attributed to commission sources, threatened to sour the mood between London and Brussels before negotiations have even begun. When the British prime minister told them "let us make Brexit a success", Mr Juncker was said to have replied "Brexit cannot be a success". At one state, to underline the complexity of negotiations, the commission president was said to have brandished copies of Croatia's EU entry deal and Canada's free trade deal which runs to 2,000 pages. Mrs May was also said to have angered the EU side when she warned that the UK could not be forced to pay a "divorce bill" for leaving because there was no requirement under the treaties, which drew the response that the EU was "not a golf club". 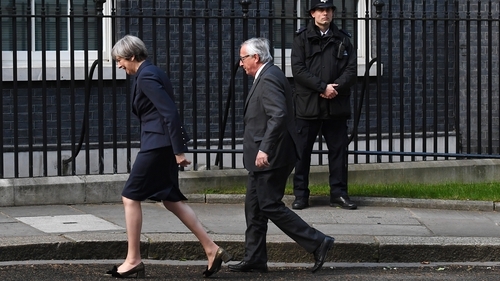 As he left, Mr Juncker was said to have told her: "I leave Downing St ten times as sceptical as I was before." The following morning he rang German chancellor Angela Merkel to warn her that Mrs May's approach was from a "different galaxy". Mrs Merkel responded by re-writing a speech she was giving that day to warn that some in Britain were still harbouring "illusions" about the Brexit process. Labour leader Jeremy Corbyn warned that Mrs May's negotiating strategy was unravelling. "Of course they are going to be difficult (negotiations), but you start from the basis that you want to reach an agreement, you start from the basis that you have quite a lot of shared interests and values," he said. "If you start from that basis and show respect, you are more likely to get a good deal. But if you start with a megaphone, calling people silly names, it is not a great start to anything." Liberal Democrat Leader Tim Farron said: "It's clear this government has no clue and is taking the country towards a disastrous hard Brexit." For the SNP, Scotland's minister for UK negotiations with the EU Michael Russell said: "Leaving the EU with no deal - and no agreement on access to the single market - would be an unprecedented act of self-harm which would devastate the UK and Scottish economy."